There are many paths into the Food truck field. There is Truck to Table – where ones goes from truck to their own restaurant. There is Table to Truck, where an established restaurant opts to go mobile to expand service or get out of the brick and mortar life. There is also the cart to truck progression. But Steve Redzinak took a different path. He started with a truck back in 2012. Then he got out of the business for a year and 1/2. But with the encouragement of many in the food truck community including: Swoop, Ajumama, Pickled Swine, Green Meanie, Matija Breads to name a few – he came back with a cart in May of 2014. 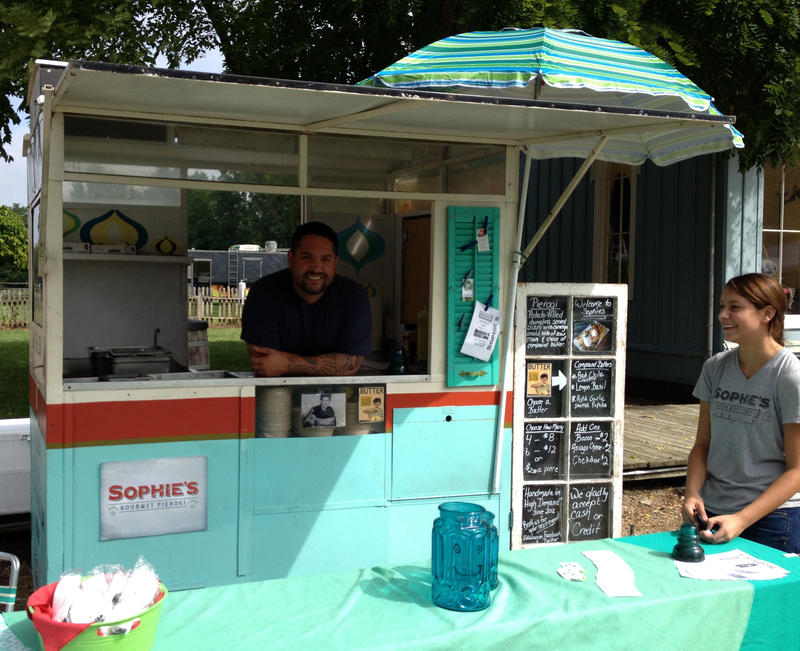 You can read more about the earlier history of the truck in our previous post about Sophie’s. The name of the cart, like the name of the truck, was inspired by two Sophie’s. 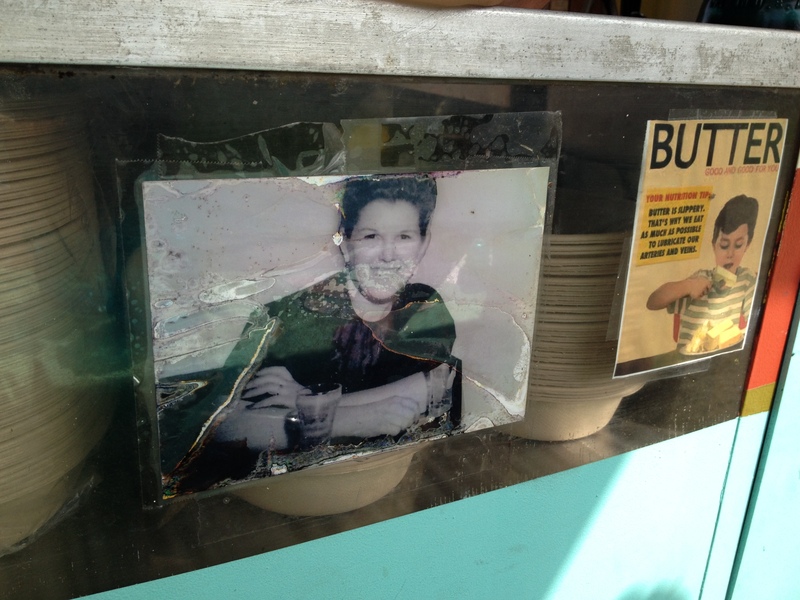 The first is Steve’s mom, who paved the way for his passion for food. His grandmother inspired many of the recipes. You can see her below. The other Sophie, is Steve’s daughter. You can see both of them in the lead photo for this post. The menu, obviously, focuses on Pierogi – which have never been widely available in Columbus. In addition to being delicious, this menu really fills and ethnic food niche. A pierogi, in case you have never tried one is boiled, stuffed dumpling from Poland and eastern Europe. The Sophie’s versions take that as a base, add interesting fillings on the inside and tasty toppings on the outside. Steve is an experienced, trained chef with plenty of experience to back up his family recipes. During his break from the business, he took what he learned from Sophie’s 1.0 and applied it to the cart to make it a leaner, more viable business. This is what Steve shared with me. “We scaled down our mobile unit, simplified the menu while increasing our production ability. Our commissary is at Smokie’s BBQ / Little Tony’s Pizzeria on 900 Columbus Ave. in Marysville. 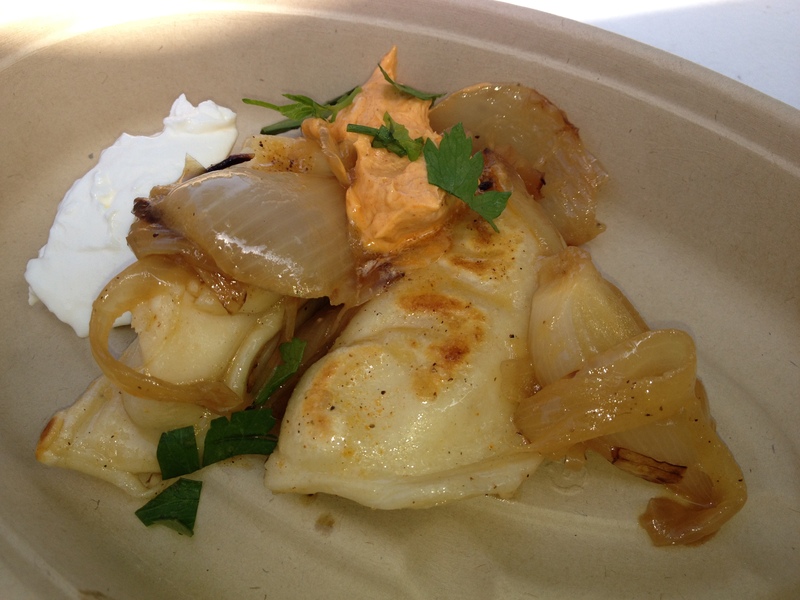 As of Sept 1st, our Pierogi will be available Monday through Saturday for Dinner 4-9pm at Smokie’s BBQ. We are also supplying a few restaurants with our Pierogi such as Jail House Rock @ Little Rock Bar and Explorers Club” (Jailhouse is the brick and mortar version of Paddywagon and Explorer’s Club also has a food truck). If you can’t find the cart out and about head to the other locations listed above. 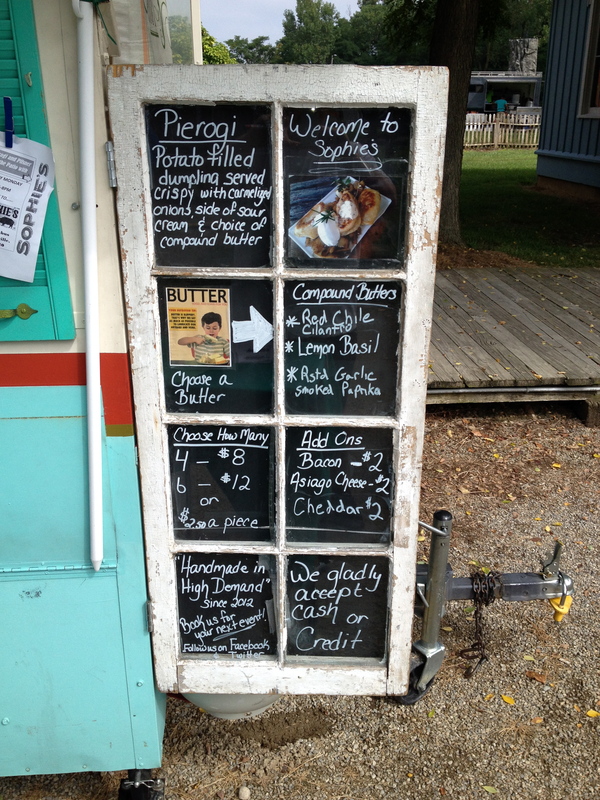 We have an example of a typical pierogi menu below. And here is a photo of a Sophie’s pierogi at it’s finest. This entry was posted on September 11, 2014 at 3:07 PM	and is filed under Mobile Food. Tagged: Sophies Pierogi. You can follow any responses to this entry through the RSS 2.0 feed. You can leave a response, or trackback from your own site.